We were honored to welcome the members of Chaopraya to our campus for a performance of Thai music and dance. Students study biodiversity and conservation in Sarawak, Malaysian Borneo. Watch video of the symposium on our Virtual Symposium page! The 2nd annual LIASE Southeast Asia Symposium, focused on topics related to conservation and biodiversity in Malaysian Borneo and throughout Southeast Asia, while highlighting Thai culture and conservation in anticipation of our 2016 field course. The Symposium featured participants and Southeast Asianist scholars from universities around the Northwest, regional cuisine, a Thai music and dance performance, PacRim student research presentations on Southeast Asian topics, as well as talks from students who have conducted research as part of the LIASE sponsored field school and course of spring and summer of 2015. Our keynote speaker was Professor Philip Dearden of the University of Victoria. Professor Dearden is an esteemed scholar of marine conservation in Southeast Asia and leader of the Marine Protected Areas Research Group. His talk was titled "Highlands to Islands: Insights on Conservation and Culture from Thailand"
Professor Philip Dearden of the University of Victoria is an esteemed scholar of marine conservation in Southeast Asia and a leader in incentive-based conservation and working with communities to generate benefits from conservation activities. Most of Professor Dearden's career has been spent in the tropics and particularly in Southeast Asia. He has had active research programs in Thailand for over 25 years and worked throughout other countries in the region, particularly Cambodia. 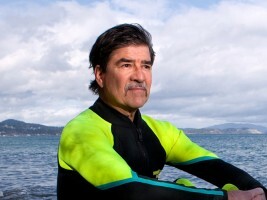 Most of his activity is now focused on the marine environment, both in Canada and overseas. He leads the Marine Protected Areas Research Group (MPARG) and has research interests ranging from marine mammals and seagrass ecology through to coral reef monitoring, community-based governance, shark watching and SCUBA diver management in South East Asia. His talk is titled "Highlands to Islands: Insights on Conservation and Culture from Thailand"
This meeting, which is open to all interested faculty and staff, is focused on articulating and shaping the goals of SE/NW by allowing Southeast Asianists in the region the opportunity to discuss potential collaboration and the sharing of institutional resources. The discussion will focus on resource sharing and collaborations in the areas of pedagogy, professional development, and study abroad. Our first student research panel features presentations from undergraduates involved in our 2015 LIASE field school, who studied and conducted research on issues related to biodiversity and conservation. 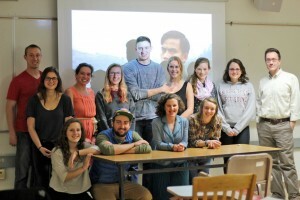 Their projects involved a semester of study on our campus, with biology professor Peter Wimberger and numerous guest speakers, as well as three weeks in Sarawak, Malaysian Borneo. Our second student research panel features research presentations from students on our 2014-15 Pacific Rim Asia Study-Travel Program (PacRim), in which all students conduct in-depth independent study projects. In this past year's program, a number of students conducted projects focused on Southeast Asia-related topics, as the group spent extended periods of time in Vietnam, Thailand, and Indonesia, while also traveling through Malaysia and Singapore. Nick Kontogeorgopoulos discussed his upcoming LIASE field school course, Political Economy of Southeast Asia (IPE 333), and distribute applications. The course includes three weeks studying ecological challenges through a cultural lens near Chiang Mai, Thailand, at the end of the semester. Admission to the course, which subsidizes student costs significantly, is expected to be competitive, so attending the interest meeting as well as the research sessions (above), in which prior field course students will discuss their experiences, is highly recommended. The application form is available here. The course serves as an overview of the political, economic, social, and cultural processes shaping the region known as Southeast Asia. It utilizes a range of disciplinary approaches in order to illustrate patterns of change in the Southeast Asian context. Throughout, the course integrates discussion of theoretical issues with examples from around Southeast Asia. By applying theoretical material to specific countries and real-world examples, the class explores the ways in which broad perspectives intersect with economic, political, and social issues to shape the nature and direction of change in Southeast Asia. What does it mean to be a Southeast Asianist in your smaller / liberal arts institution? How can we better integrate Southeast Asia into our classrooms and broader curriculum? What have been your (or your institution’s) successes and failures in generating student interest in Southeast Asia? After the Faculty Roundtable session, symposium participants and invited guests move to Trimble Forum to enjoy a selection of Thai dishes from Tacoma's Indochine restaurant. The banquet is an opportunity to continue our discussion from the day with student researchers, guests, and visiting faculty. This will also serve as an opportunity for invitees to informally talk with presenters about their research and experience in Malaysia and throughout Southeast Asia, and to ask questions about the broader LIASE program at Puget Sound with the Puget Sound faculty who administer it. Vegetarian and allergy-friendly options will be available. We are honored to welcome the members of Chaopraya to our campus for a performance of Thai music and dance. Chaopraya Ensemble was formed in the spring of 2001 with the intent to provide opportunity for the children of Thai immigrants in the Puget Sound area to keep alive and learn about their ancestor’s cultural heritage, especially in music and dance. Some of its members have, however, been performing together in the Puget Sound region since 1976. The ensemble performs Thai classical and folk music on traditional Thai instruments as well as a wide range of dances, from lively regional folk dances to the graceful and stylish court dances. This performance is open to the whole campus community and the public -- please join us!